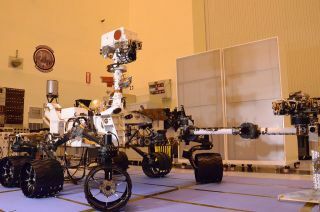 Scientists are jittery but thrilled about the upcoming launch of NASA's Curiosity rover, the largest Mars rover yet. The $2.5 billion Curiosity, also known as NASA's Mars Science Laboratory, is set to lift off Nov. 25 at 10:25 a.m. EST (1725 GMT), atop an Atlas 5 rocket from Cape Canaveral Air Force Station in Florida. The 1,980-pound (900-kilogram) vehicle has been under development for seven years. "It's a momentous occasion," said Doug McCuistion, director of the Mars program at NASA headquarters in Washington, during a briefing today (Nov. 10). "We're just thrilled that we're at this point. It's not your father's rover." "This is a Mars scientist's dream machine," said Ashwin Vasavada, Curiosity deputy project scientist at NASA's Jet Propulsion Laboratory in Pasadena, Calif. "It's the most capable scientific explorer we've ever sent out" to another planet. Another distinctive feature of the rover is its unique landing mechanism, designed to accommodate its hefty size. After an 8 1/2-month flight, the spacecraft carrying Curiosity will begin descending to Mars using parachutes. Then the descent stage of the spacecraft will take over, depending on thruster propulsion for control. When it gets close enough, the descent stage will hover and act as a "sky crane," lowering the rover gently to the ground on tethers. "We're confident, but it is clearly not risk-free," said Pete Theisinger, Curiosity's project manager at JPL. "Any entry and landing on Mars is a place where you take pause and bite your nails a little bit." The tense moment is due to occur in August 2012. Researchers chose their landing site, Gale Crater, from 60 candidate spots. The 96-mile-wide (154 kilometers) crater has a mountain in its center with exposed rock layers dating from different periods in the planet's history. Scientists think it offers a good chance to learn more about whether the Red Planet was hospitable to life in its past. "We've known now for decades that there's evidence for rivers and even possible evidence for a lake in the crater we're going to," Vasavada said.